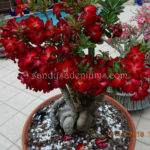 Hi my name is Sandy and I have an addiction of Adeniums other known as Desert Rose. 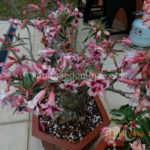 I have been collecting different Adenium Hybrids for a about 18 yrs and obtained my first Pinks 26 years ago. My aim was to obtain every colour. 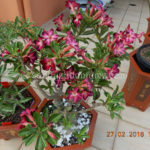 Adenium Hybrid colours are never ending which has just kept me collecting for so many years. 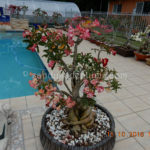 We have gone from Common Pink Adenium to different variations of Pink, then came along Reds and Whites Adenium for many years. 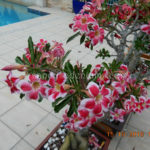 From there the Adenium colours now are vibrant with purples, yellows, blacks and now orange. Yellows Adeniums has been a much wanted colour for many years by Collectors even though they are not stable as yet but in the future should progress further. Blacks is a want for every Collector they are glorious on opening but fade very quick sometimes a matter of 12hrs they will fade down to a Dark Purple then a maroon or down to red. There are some that will keep there colour a good time but few and far between. Most times these will be purchased by Seedling and Graft Form to reproduce many . Doubles, Triples and Quad + Adeniums are the next generation Need of a collector which I have had much joy of achieving and producing my own colours. 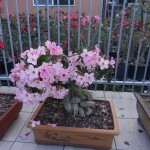 The growth of an Adenium over years is very rewarding watching the shape of the caudex platt and twist. 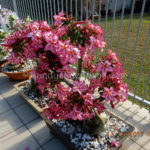 Every Adenium has its own characteristic. 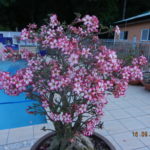 Over the years I have gone through thousands of Pink Adeniums to achieve the extrordinary colours. 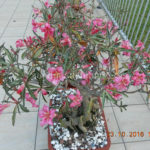 Be aware of ADENIUM FAKE SELLERS selling SEEDS, Many send pink seeds as colours and 12mths go by before you know the what it is. 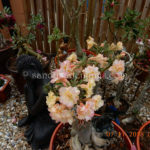 Adeniums crosspollinate and carry the natural pink gene so there is no guarantee till flowered. Handpollinating is a better percentage but still no guarantee. Grafting is a pleasure for me like a relaxation, I graft rare hybrids from my own stock that is limited to share with other collectors. I do take orders and do have some grafted stock on hand, also multigrafts gives me a challenge I enjoy. Adeniums are known to many to need very little attention, I think you only get out what you put in. Even though they are known as a drought plant they still need water as now we have so many hybrids they are not what have been growing in the desert for years. 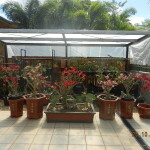 In hot summer days you can water twice a week in small pots if they have dried out, in larger pots will need less water. 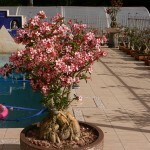 Older Adeniums with large caudex needs less watering in longer intervals. MEDIUM MIX – I am now trialing a new mix to make my life easier and lighter after a injury and will update on it when I have proven it has stood up to my expectations. OLD MEDIUM mix I have been using for many years – 1 Part Coarse River Sand, 1 Part 10 to 15 Ml Quincan, 1 Part Coir Mulch with Dynamic Lifer added.. Every person may not use exactly the same if something works for you continue using it. Every climate is different growing conditions and different Media needs .It is important not to purchase a potting mix with wetting agent, Cactus and Succulent Mix is a good mix but I still would add Quincan and Coarse River Sand. 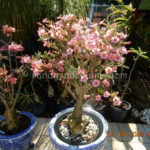 Fertiliser is I think a need to obtain the best out of your Adenium, there are many that can be used keeping in mind the Nitrogeon Level is not high. A balance is required NPK. Some products I like to use is Seasol, Powerfeed , Organic Life ,Nitrophoska, Osmocote, Orchid Booster, Potash, 5 in 1,Thrive and Flourish. This is just a guide I have suggested if you have something that works for you keep using. Each Individual has there own ways of raising. 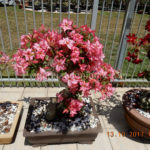 I hope you enjoy my collection and the Adeniums for Sale. 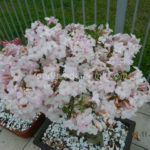 WATCHOUT FOR NEW HYBRIDS OFFERING ON MY “FOR SALE , GRAFTS AND SEEDLINGS”. MANY COLOURS MAYBE OUT OF STOCK AND MANY TIMES OFFER ONLY A FEW OF EACH. BLACKS AND PURPLES – These are very exciting colours and are far and few between most times i only will offer grafts, these colours vary in winter and do not show the true beauty of there colour. Blacks in particular will be sometimes just the red and in the high humidity and summer show the true black . Some purples also vary and will look a pinky purple but it is out of the growers control. Purple by seed is a low percentage even lower than the yellow percentage rate. MULTI PETAL – Multi petals are confusing for many people as they can flower first time Double and other times will flower Single, Multi petals can even be Quads or Triples and flower Single or Double at times even with many different Layers of Petals on one time on each flower. 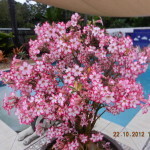 It is a problem all over the world that Growers face, I suggest Fertilise every Fortnight to get the best out of the Multi petals. 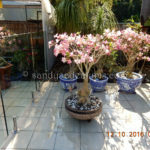 WINTER WATERING – Through winter watering is dropped back as it becomes cooler the Adeniums absorbs the due off the foliage and many Adeniums will go Dormant which water is not needed , Adeniums with foliage just a light spray every couple of weeks Depending on size of plant and pot and depending on the climate you live in. 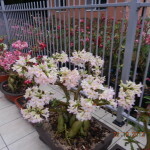 In August late our Adeniums decide to go in grow mode again and water can be increased. PESTS — Spidermite — I myself find Stealth and Kelthane the best remedy to remove them. Mealy Bug — Confidor or Maverick is what I recommend on the everyday Collector . SORRY THERE ARE QUARRANTINE RESTRICTIONS ON SOME INTERSTATES . CERTIFICATES ARE NEEDED FOR NT AND W.A SPRAYED BY QUARRANTINE BEFORE THEY LEAVE AND AT A COST TO BUYER WHICH IS VERY AFFORDABLE AS I SEND MULTIPLE ORDERS AT ONCE , EMAIL ME IF YOU ARE WISHING TO GO THROUGH WITH THE PROCEDURE FOR THE COSTS.